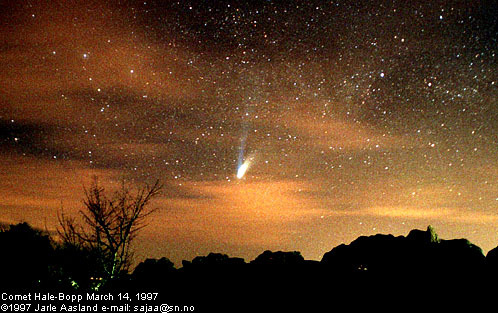 Explanation: Does a comet's dust tail always orbit behind it? Since comets rotate, they shed gas and dust in all directions equally. Small ice and dust particles expelled by the comet, however, are literally pushed around by sunlight. The smaller the particle, the greater the effect. When the comet is headed inward, sunlight slows down small particles so they orbit behind the comet. When the comet is headed back out though, sunlight speeds them up, so small particles orbit in front of the comet. 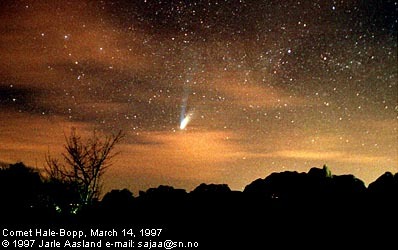 Comet Hale-Bopp itself is too big to have its orbit affected by the momentum of sunlight. Therefore, since Comet Hale-Bopp started back out to the outer Solar System two days ago, we can expect the dramatic dust tail shown above to shift in front in the coming days.